(Nanowerk News) A new approach in the design of miniature, insectlike robots could lead to "microids" the size of ants that move their tiny legs and mandibles using solid-state "muscles." Advanced computer simulations indicate these synthetic bugs would have significantly better dexterity than previous microscale robots. The robots also might be able to "scavenge vibrational energy" from the environment to recharge their power supply, said Jason Clark, an assistant professor of electrical, computer and mechanical engineering at Purdue University. 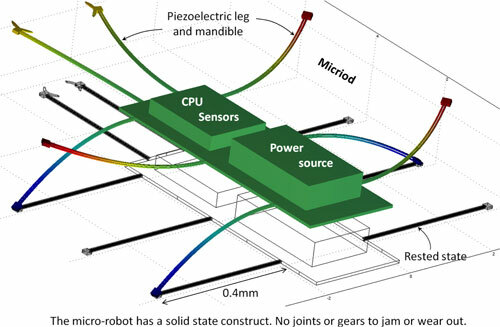 The new design differs from previous microscale robots that use complex moving parts meshing together or touching each other, which subjects them to wear from friction and jamming from dust particles, he said. "The complex moving parts ultimately limit their lifetime and confine their use to a controlled laboratory environment," Clark said. "Because the microids are solid state without any discrete parts such as gears that wear due to frictional contact, they will likely be long-lasting and robust. If a microid were stepped on, it would probably just get up and walk away." His concept, a sort of solid-state muscle for microid legs and mandibles, would allow the robot to nimbly traverse harsh environments such as sand or water. The concept appears to be the first to show such insectlike characteristics at the microscale, he said. "The microids would be able to walk, run, jump, and pick up and move objects many times their own weight," Clark said. "A microid can also do what no insect or other microrobot can do, which is continue walking if flipped on its back. Who knows, maybe flight is next." He also envisions the possibility of hordes of microids working in unison and communicating with each other to perform a complex task. "You can't underestimate the power of having thousands of microids working together, much like ant colonies," he said. The microids could be mass-produced using manufacturing technologies that are common to the semiconductor industry. Purdue has filed a patent application on the concept. The microids are designed to have the "tripod gait" for walking used by most insects - only three of six legs are on the ground at a time - which enables bugs to remain stable while traversing uneven terrain. Each leg or mandible comprises a bundled triad of slender beams made of piezoelectric material, which generates electricity when compressed. This feature could enable the microids to harvest energy by taking advantage of vibration in the environment to recharge. Whereas such piezoelectric materials ordinarily do not expand enough to be useful for robotics, simulations indicate the new design overcomes this limitation: if the three beams are joined together only at both ends, applying a voltage to one or more of the beams produces a surprisingly large lateral movement, Clark said. Through advanced simulations, the researchers were able to explore various design configurations for the best performance. Currently, the researchers are working on fabricating a simplified proof of concept of a microid at the Birck Nanotechnology Center in the university's Discovery Park. This research grew out of previous work led by Clark to develop computer-aided engineering tools for the design, modeling and simulation of complex engineered systems. The tool enables engineers to explore more complex microdevices than could be done using previous tools.